Use TidySongs to add iTunes Album Artwork. 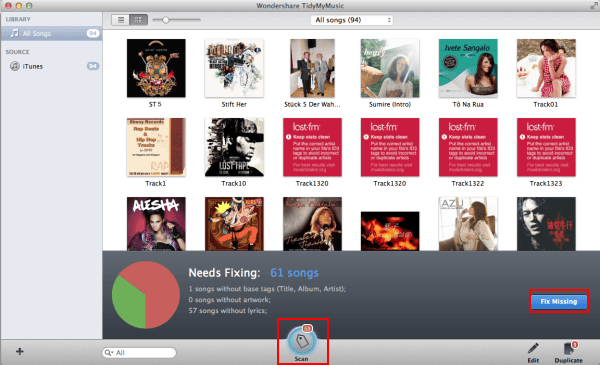 TidySongs will scan your iTunes library to find missing album art for your music. TidySongs will search for original album art over compilation/best of albums so that you can have the most accurate fixes for your missing album files. As TidySongs finds all your missing album art you’ll rediscover some of your favorite albums. As I was rediscovering some of my own older album covers I also found I can get them on a bottle of wine?? Wines That Rock is now selling wine, labeled with album art. Currently, there are 3 wines for sale with 3 different albums, but the website says that plans to uncork more wines and more album labels are in the works. The first three: Forty Licks Merlot (Rolling Stones), Woodstock Chardonnay and The Dark Side of the Moon (Pink Floyd) Cabernet Sauvignon. Before you buy wine with your favorite album art, you’ve got to fix your missing album art. 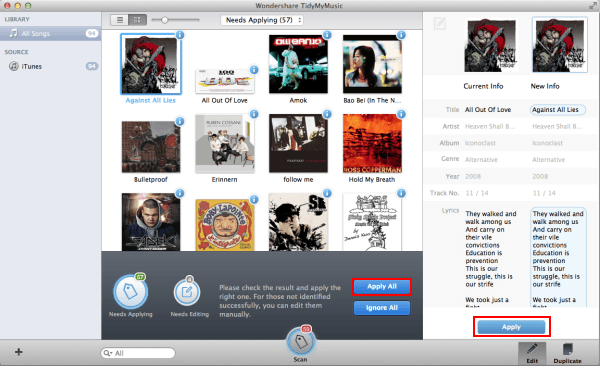 TidySongs will add iTunes Album Art. Launch TidySongs after installed. 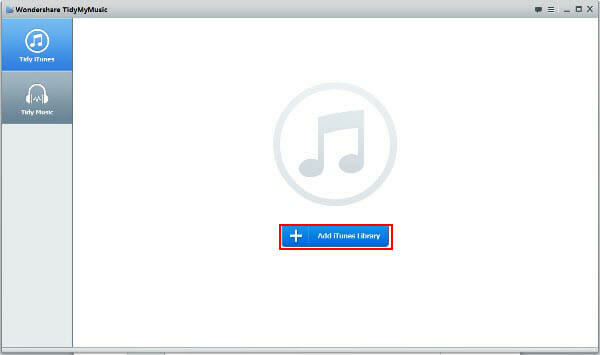 Then your iTunes library will be scanned and added to the program automatically. And next time you open the program, it will do the scanning again in case that you have added new songs to your iTunes library. Click the Scan button in the header and tick the checkbox of “Search for Unidentified Songs”. Then this program will start to find the unidentified songs and identify them along the way. During the process, all information can be found out, including album art, track details, lyrics and more. After all the information is found out, including the album art, you can select one song and check the information in the right column. Then click the Apply button on the bottom right to embed the information to the song. You can also select several songs in a row and apply at the same time.